This highly original interpretation of Paul by the Jewish philosopher of religion Jacob Taubes was presented in a number of lectures held in Heidelberg toward the end of his life, and was regarded by him as his "spiritual testament." Taubes engages with classic Paul commentators, including Karl Barth, but also situates the Pauline text in the context of Freud, Nietzsche, Benjamin, Adorno, Scholem, and Rosenzweig. In his distinctive argument for the apocalyptic-revolutionary potential of Romans, Taubes also takes issue with the "political theology" advanced by the conservative Catholic jurist Carl Schmitt. 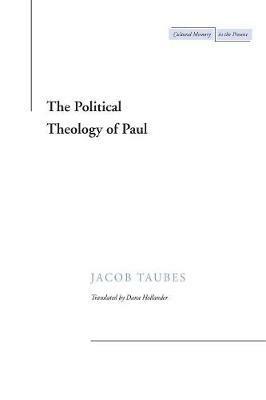 Taubes's reading has been crucial for a number of interpretations of political theology and of Paul-including those of Jan Assmann and Giorgio Agamben-and it belongs to a wave of fresh considerations of Paul's legacy (Boyarin, Lyotard, Badiou, Zizek). Finally, Taubes's far-ranging lectures provide important insights into the singular experiences and views of this unconventional Jewish intellectual living in post-Holocaust Germany. This highly original interpretation of Paul by the Jewish philosopher of religion Jacob Taubes was presented in a number of lectures held in Heidelberg toward the end of his life, and was regarded by him as his "spiritual testament." Taubes engages with classic Paul commentators, including Karl Barth, but also situates the Pauline text in the context of Freud, Nietzsche, Benjamin, Adorno, Scholem, and Rosenzweig. In his distinctive argument for the apocalyptic-revolutionary potential of Romans, Taubes also takes issue with the "political theology" advanced by the conservative Catholic jurist Carl Schmitt. Taubes's reading has been crucial for a number of interpretations of political theology and of Paul--including those of Jan Assmann and Giorgio Agamben--and it belongs to a wave of fresh considerations of Paul's legacy (Boyarin, Lyotard, Badiou, Zizek). Finally, Taubes's far-ranging lectures provide important insights into the singular experiences and views of this unconventional Jewish intellectual living in post-Holocaust Germany. The late Jacob Taubes held the chair in Hermeneutics at the Free University of Berlin. In the U.S., he taught as a visiting professor at Harvard. Taubes apparently published little during his lifetime, but had a very great influence as a teacher. In addition to the present posthumous volume, the Assmanns and others have edited a collection of his writings from 1953-1983 entitled Vom Kult zur Kultur: Bausteine zu einer Kritik der historischen Vernunft; two volumes of his works are currently coming out from Suhrkamp. This would be his first book to be translated into English. Aleida Assmann is Professor of English Literature and Literary Theory at the University of Konstanz. Jan Assmann is Professor of Egyptology at the University of Heidelberg. Moses the Egyptian: An Essay in Mnemohistory (Harvard, 1997) and Re and Amun: The Crisis of Polytheism in New Kingdom Egypt (Routledge, Chapman, & Hall, 1995) are his books to appear in English.